Every month we have a wonderful kids party called Pajamanastics! Often held on the first and third Saturdays of the month from 5:30pm to 10:30pm! 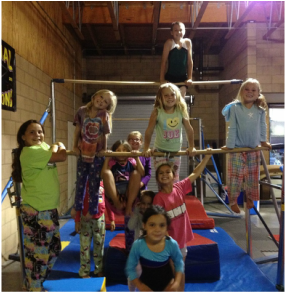 The kids come in their pajamas, do gymnastics, play games, eat pizza and have a blast!! A perfect opportunity for the parents to enjoy a grown up night out! Call the office to reserve your spot! The cost is only $35 per child! Ask for sibling discount, too!